Ask me what makes a restaurant an immediate hit and I’d be quick to use Marjorie as a case study. Donna Moodie’s new Capitol Hill restaurant pulses with good energy and a casual vibe, and its menu made me say, “Ooh, I want that, and that, and that too!” When a restaurant feels as if it’s been open for months, or even years, on the first day in business, well, that’s the real clincher. It’s a feeling I wish I could bottle and sell. It’s exactly the sense I got when I walked into Matt Dillon’s relocated Sitka & Spruce, which made its debut last night (more on that in an upcoming post). For the record: while Moodie and Dillon are tenured pros — each having envisioned and opened several restaurants in the past — both managed to make the debut of their freshman-effort appear effortless as well. The new Marjorie is smaller and far more intimate than I imagined it would be when I sneaked a peek prior to the build-out. Walk in and you’re looking at a 10-seat bar and the tiny kitchen. To the left is a communal butcher-block table for eight, plus a handful of tables: 40 seats in all, and garage-style doors that open onto a warm-weather patio with room for 30 more. 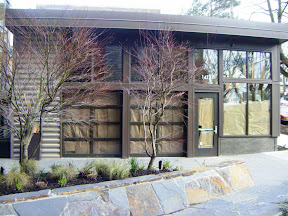 Marjorie, at 1412 E. Union Street, now (left) and then (in February). The Capitol Hill contingent checking out Marjorie on opening night. Recognize anybody? That’s Donna’s son Max in the foreground, and Rick from Elliott Bay Book Company chatting up Plum Bistro’s Makini Howell and friends. As for the food. . . It was produced by a talented crew led by 26-year-old Kylen McCarthy, whose sous chef (Jeremiah del Sol), tournant (Tyson Danilson) and pastry chef (Taylor Cheney) will look familiar to anyone who’s recently spent time at Madison Valley’s Harvest Vine. “They asked me if they could come,” explained McCarthy, who’d been sous-chef at Harvest Vine for over a year. Here’s video of the cooks, and the crowd at the bar — including Spinasse’s Jason Stratton and his sous-chef Carrie Mashaney, who showed up after a busy night at work to check out the neighboring competition. So, what’s cooking at Marjorie? Well, here’s a look at my meal (you’ll find menus on the website, here), and several other noshables shared around the communal table by fellow diners, including Moodie’s son Max who enjoyed a slice of arugula-topped pizza — and has clearly changed his tune since 2003, when he was a persnickety little fellow who wouldn’t eat anything green. Pizza with ricotta, arugula and prosciutto. A meaty terrine, with brioche toast and housemade pickles. Castelvetrano olives, with fennel seed, orange and chiles. Fresh “pea soup.” Yes, soup. With porcini flan hiding under those petite pea-shoots. Crispy branzino with carrot pomegranate chermoula. Marjorie’s open Tuesdays through Saturdays at 5 p.m. and takes a handful of reservations while encouraging walk-ins. So, anybody else been? What did you think? And if you care to give a shout-out to any other brand new restaurant that’s made you say: “Wow. That’s impressive!” please be my guest.